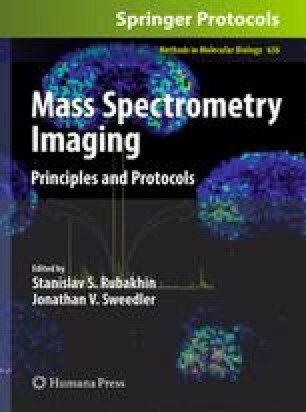 Matrix-assisted laser desorption/ionization (MALDI) mass spectrometry imaging (MSI) can determine tissue localization for a variety of analytes with high sensitivity, chemical specificity, and spatial resolution. MS image quality typically depends on the MALDI matrix application method used, particularly when the matrix solution or powder is applied directly to the tissue surface. Improper matrix application results in spatial redistribution of analytes and reduced MS signal quality. Here we present a stretched sample imaging protocol that removes the dependence of MS image quality on the matrix application process and improves analyte extraction and sample desalting. First, the tissue sample is placed on a monolayer of solid support beads that are embedded in a hydrophobic membrane. Stretching the membrane fragments the tissue into thousands of nearly single-cell sized islands, with the pieces physically isolated from each other by the membrane. This spatial isolation prevents analyte transfer between beads, allowing for longer exposure of the tissue fragments to the MALDI matrix, thereby improving detectability of small analyte quantities without sacrificing spatial resolution. When using this method to reconstruct chemical images, complications result from non-uniform stretching of the supporting membrane. Addressing this concern, several computational tools enable automated data acquisition at individual bead locations and allow reconstruction of ion images corresponding to the original spatial conformation of the tissue section. Using mouse pituitary, we demonstrate the utility of this stretched imaging technique for characterizing peptide distributions in heterogeneous tissues at nearly single-cell resolution. We thank Georgina M. Aldridge, University of Illinois at Urbana-Champaign, for providing the animals. The project described was supported by Award No. P30 DA018310 and Award No. 5RO1DA017940 from the National Institute On Drug Abuse and Award No. 5RO1DE018866 from the National Institute of Dental and Craniofacial Research (NIDCR) and the Office of Director (OD), National Institutes of Health (NIH). The content is solely the responsibility of the authors and does not necessarily represent the official views of the NIDA, NIDCR, or NIH.